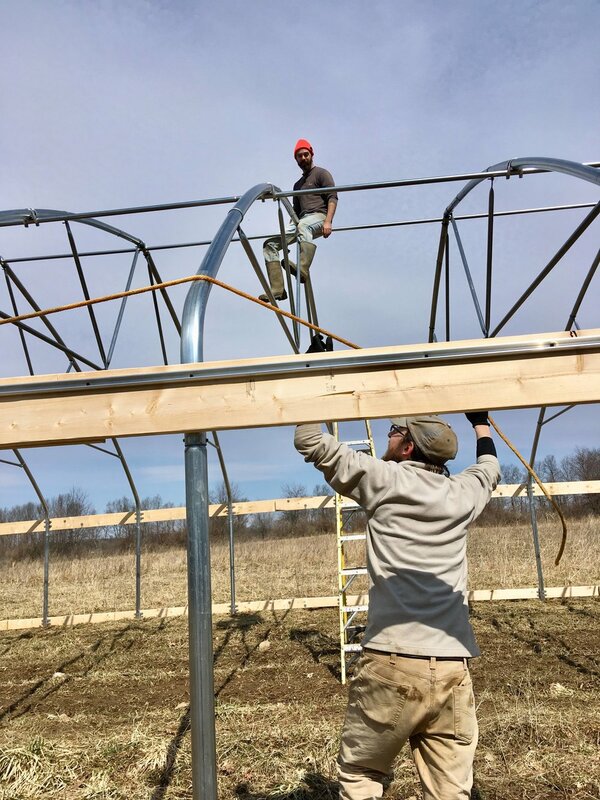 With a lot of sun and just a little wind in the forecast for the first day of spring, we decided to take a crack at putting the plastic on our new 95-foot by 30-foot high tunnel. Past experiences with the caterpillar tunnels taught us that even a little wind spells big trouble when you’re clinging like a clothespin to a giant sheet of plastic, but we have to get planting in this tunnel ASAP, so we just needed to go for it. Our crew for the day included me, Jason, Angelica, Gary (my dad), and Garrett Gleeson, of Fat Hawk Farm. All ten hands were constantly at work from morning to late afternoon, wrangling giant rectangles of plastic. In total, the tunnel is comprised of five separate plastic sheets. We needed to put up the end walls first, and those went surprisingly smooth. Next up, was the roof, and that 40-foot by 110-foot rectangle proved to be more of a challenge, especially as the wind kicked up. At first, we attempted a more experimental method. The plastic came to us folded up in a long strip. Jason tied one end of the strip to a rope, and then we all helped feed the strip up to the top of the frame, where Garrett sat, pulling the rope. Our first attempt at the roof plastic. An internet video, coupled with boundless optimism, made us try pulling the plastic in one big strip over the very top of the frame. We all fed it up, while Garrett (seated) pulled it. It ended up slipping down one side. It’s certainly possible this method could work for someone with a little tweaking. We were attempting to drag the plastic strip along the very top of the frame, and then let the plastic sides drape over. While demonstration videos prove it is possible, our attempt was unsuccessful. The plastic strip ended up slipping to one side. So, we went with the classic approach. We tied two baseballs on one end of the plastic, and then tied ropes around the baseballs. A couple of us went to the opposite side of the structure and started pulling the ropes, working the plastic up and over the frame, while other helpers worked hard to feed the plastic up by hand, either on the ground or on the ladder. The baseball and rope method is what we’d recommend. What says spring more than a baseball? Two old baseballs made the plastic task possible. Jason ties a baseball in the plastic. We tied ropes around two baseballs and used them to pull the plastic up and over the roof. However, when we had the plastic up and over the frame, we weren’t paying close enough attention, and Angelica was the only anchor on the one side. One person is absolutely no match for the wind when it gets under that much plastic. The wind flipped the plastic completely off the frame. For our second attempt, we were more vigilant about the wind, and clung to the plastic at key points as tight as we could. To hold the plastic in place, you work metal wiggle wire into metal channels. As soon as we started this, we realized we weren’t getting a good, tight fit overhead. The roof plastic was sagging. Garrett came up with the idea of bunching the end of the plastic with a baseball inside, tying a rope around the baseball, and then tethering it to Gary’s tractor. This worked like a charm. The tractor supplied the needed weight to pull the plastic tight and get out the sags. When we started putting the metal wiggle wire in the metal channel, to hold the roof plastic in place, we noticed the plastic was sagging. Garrett came up with the idea of tethering the plastic to the front-end loader. The tractor’s weight pulled the plastic tight and eliminated the sagging. After a total of about five hours, the end wall and roof plastic pieces were firmly in place with wiggle wire and screws with over-sized washers. A plastic project that size would have been impossible with just Angelica, Jason, and me. Once again, family and neighbors have stepped up to bring a project to fruition. Today, Jason and I will start on the tunnel’s plastic sides, which should be much less difficult than the ends and top. We should be planting in this tunnel in a matter of days. End plastic and roof plastic in place. What a relief! As you can see, Angelica is back for her second season with us. She arrived on Monday morning after spending the winter with her mother on the Dutch-owned island of Bonaire, off the coast of Venezuela. On the island, she had a job, and she also volunteered with a sea turtle conservation organization. Before returning to the United States, she and her mother went on an incredible backpacking adventure across part of Europe. Her favorite place was Spain, with its flamenco dancing and delicious paella. Angelica spent a few days with us before hopping on a plane to Florida for a wedding, and time with family and friends. How we loved catching up with all her adventures! She’ll be returning to the farm in a few days. What’s a day on the farm without a few mishaps? To protect the names of the innocent, we’ll simply list the incidents and not the victims. — Someone tripped over a rope while running to catch a corner of billowing plastic and went face first into the mud. There may very well be a perfect forehead and nose imprint up there. — Two other people accidentally took a seat in the mud bog in the farm driveway. — And someone else accidentally drilled the back of their ear. OK, they didn’t actually drill, but they did catch themselves in the back of the ear with the drill. After all the work this person did atop a 12-foot step ladder in the wind these last few weeks, we’ll cut him a break about this one. No farm project is complete without a little blood. March 20 was the first day of spring, it was also my birthday. Spending my special day outside, under a warm spring sun with great people was the perfect start to my new year. Thanks to my mom, the day was topped off with a homemade birthday dinner. No. 34 looks promising! This was my hair all day, thanks to plastic static.